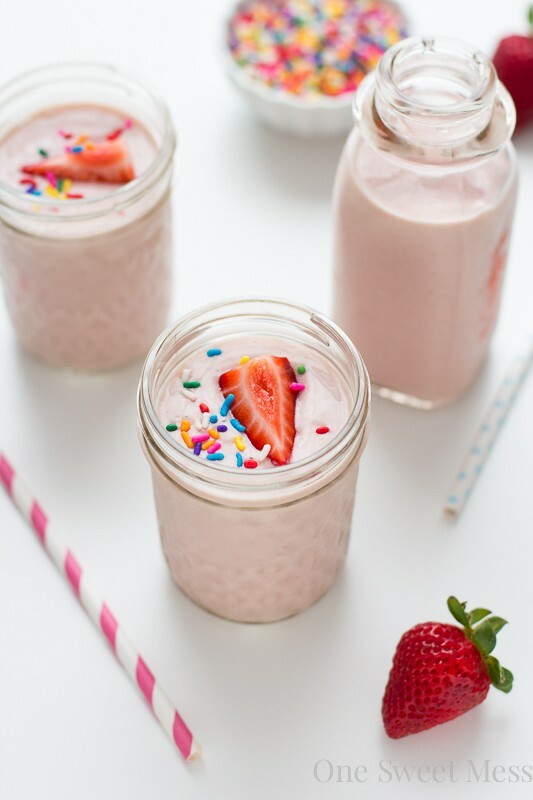 This Strawberry-Banana Cake Batter Smoothie is a frothy blend of frozen bananas and strawberries, creamy vanilla yogurt, a few scoops of funfetti cake batter, and sweet vanilla almond milk. It’s a fun smoothie for the kid in all of us! I’m always looking for ways to stay cool during the blistering hot months of summer. I can always count on a thick, frothy, ice-cold smoothie to do the trick. And, it’s full of healthy, wholesome ingredients I can feel good about. I usually enjoy a smoothie every evening while I indulge in my Netflix series–I’m currently obsessed with Orange is the New Black. As I was gathering the ingredients to make my smoothie, I noticed the box of funfetti cake mix on my counter and light bulb went off. The last time I used cake mix in a recipe was in this Chocolate Banana Cake Batter Shake recipe and it turned out amazing, so I decided to give it another go. Only this time, I decided to go the healthy route. Instead of ice cream, I used frozen bananas and Yulu Aussie-Style Yogurt to create an ice cream-like base. It has the same thick, creamy texture as ice cream, minus the unnecessary calories. Each container of Yulu Yogurt is double smoothed to create an ultra creamy yogurt, and it’s made with only the best, all-natural ingredients. This smoothie gets its classic cake batter flavor from the addition of boxed funfetti cake mix and a combo of vanilla and almond extract. I added a little honey for an extra kiss of sweetness. This fun smoothie will be loved my adults and kids alike. It’s the perfect frozen beverage to beat the heat. A frothy blend of frozen bananas and strawberries, creamy vanilla yogurt, a few scoops of funfetti cake batter, and sweet vanilla almond milk. Place all ingredients (except for sprinkles) in the bowl of a blender. Blend until smooth. Divide smoothie between 2 glasses. Garnish with sprinkles, if desired. This smoothie is my EVERYTHING. Only in my dreams have I thought I could drink cake batter for breakfast, and actually feel healthy and stuff. Then you posted this, and I am in LUHVE. Pinned! CAKE MIX IN A SMOOTHIE, I LOVE YOU! I don’t know why I never thought of that. Funfetti definitely trumps all the cake mixes IMO…I hope they make a GF version one day (if they don’t already….?) Loving this refreshing dessert-for-breakfast situation you’ve got going on! This is such a cute idea, and the kid in me would love it! I’ve been watching the new OITNB season as well, and OMG! It just got really good. My kids will love you for this recipe! LOVE this smoothie idea! Yummed and pinned! Cake for breakfast? Cake for breakfast! This looks awesome and the presentation is adorable :) Yum! Well now you have me wanting to make a smoothie next time I binge on Netflix! haha this looks so good! And I love the colors! I love smoothies and thus is such a fun one! I’m saving Orange is the New Black for awhile, and instead binging on Scandal. It’s sooooo good! You made cake healthy? And pretty? I love everything about this! I keep meaning to start Orange is the New Black, because I hear nothing but good things about it. Sometime this summer, I’m sure. And this has to be the most fun smoothie EVER. I love the fresh vanilla bean flavor of Yulu. Perfect choice. The addition of cake batter and Yulu yogurt makes this smoothie sound more fun to drink! Is this a joke!! Holy YUMMMM in my mouth! Quite possibly the tastiest smoothie ever! YUM! I just finished the series, I might have binged on the back half of it. This smoothie would have made it even better! Strawberry, yogurt and funfetti!